Gannon Gaige gets down the Sacrifice way. 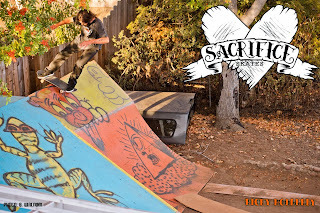 Sacrifice welcomes Nor-Cal young gun Gannon Gaige to the flow team....Look for more photos and video coming soon! Our newest and best ad to date in the new issue of Low Card Magazine. Pick one up and support real skateboarding! Original ad lay-out by Bart Saric 2004. 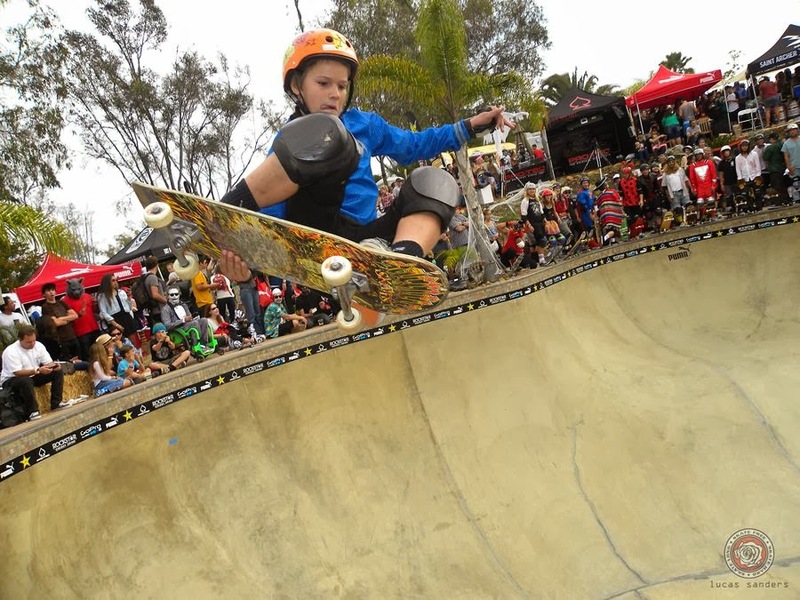 Sacrifice Skates came out to celebrate Halloween the skateboard way at this years Bucky Lasek BooBBQ. Thank you to all the team riders who came out and shreded one the the craziest bowls ever!! Lucas Sanders pulled off a man size Mctwist and Eli Reams went at it full throttle. El Veterano, Richard Sanchez got his as well. Big thanks to Jon Geurrero for filming all the action and Frank Fernandez for killing it no pads! Thank You Bucky and see you next year! 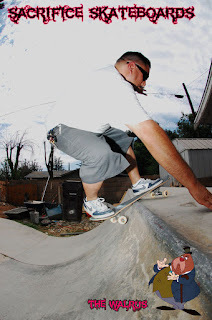 Photog Roberto Barrios caught this killer back side air at Irwindale skatepark. Little Frank is throwing on his big boy pants now! It's all about progression...and having fun of course! "El Veterano" throwing down and getting it done the Sacrifice way! One of my compadres is back from a long trip away...Time for shredding! 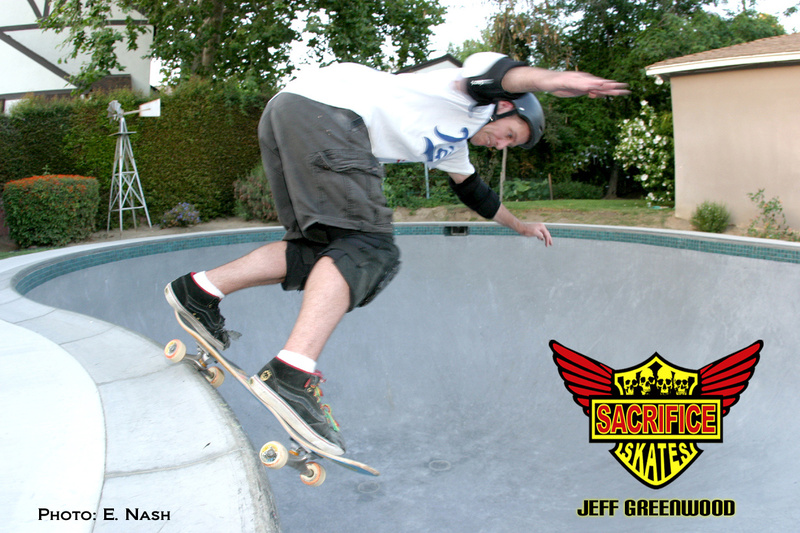 Remember: All Sacrifice decks are 100% American Made in Ontario California! 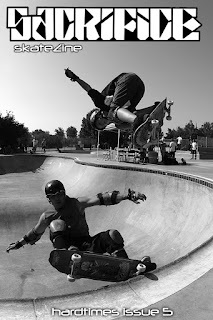 Team Rider Ricky Holderby showing what true dedication is all about. Sacrifice Skates Por Vida! BJ Morrill has sailed away into the sunset....adios and good luck! X-TEAM RIDER, BJ MORILL has decided the grass is greener on the other side. We wish him all the luck in the world...Adios! Nothing like some StaleFish to get the blood pumping. Lucas likes his served extra stinky! Richard Sanchez 'Purple Filero' Give-Away! O.K. 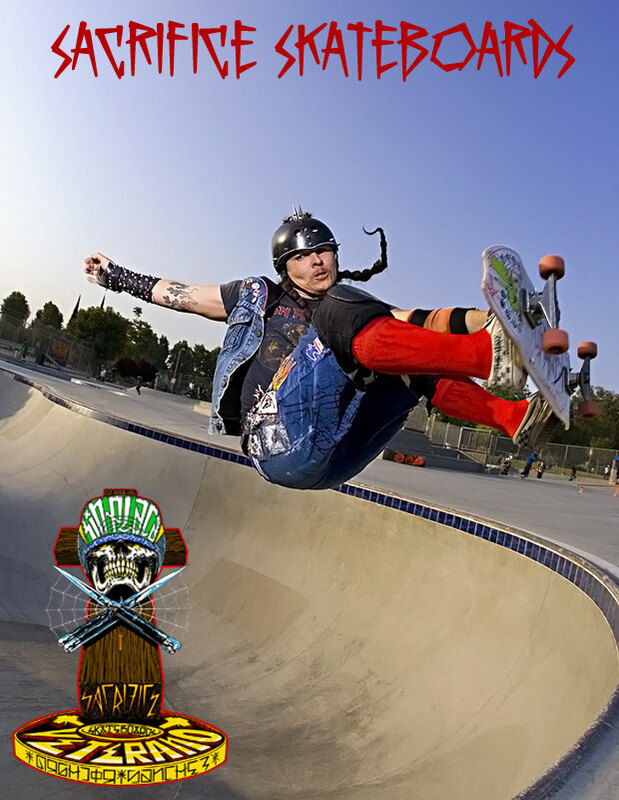 Vatos and Locas, our new contest/give-away for 2013. 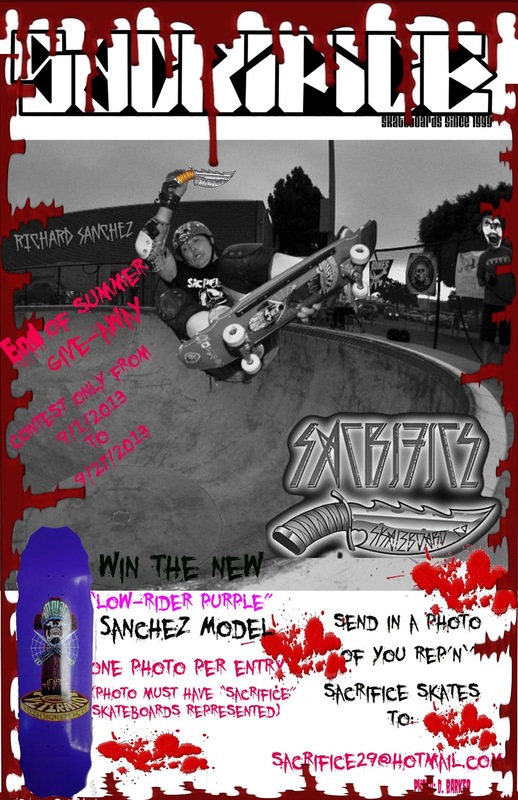 Send in a photo of you representing Sacrifice Skates and you will be entered into a drawing to win the new Sanchez "Low Rider Purple" filero deck. Only one photo/entry per person, contest starts 9/1/2013 and ends 9/27/2013. Photo must contain "Sacrifice Skates" or display Sacrifice products. 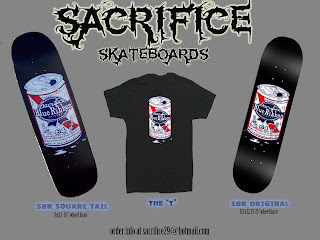 Anything from Sacrifice Skates: boards, stickers, shirts, hats, patches... or be creative and make your own Sacrifice Skates logo to display in your photo. Good Luck, winner will be announced October 1st. 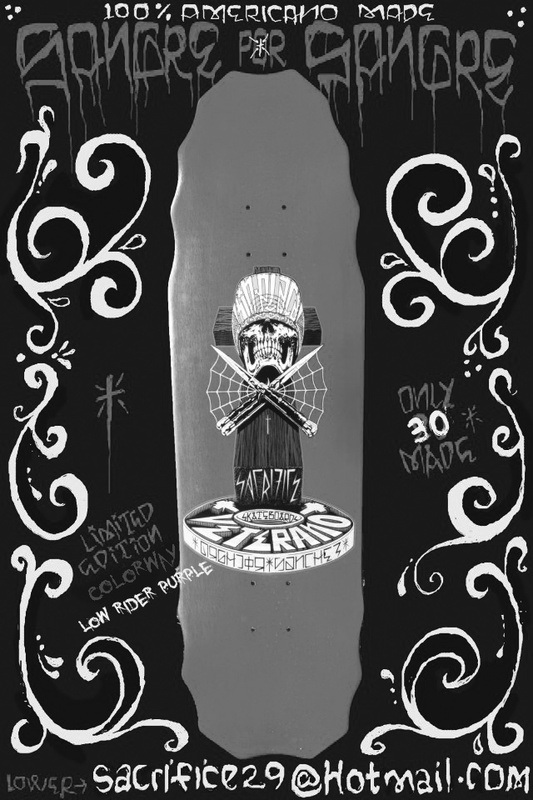 Richard Sanchez "Low Rider Purple" Color-Way Decks Are In! New Color Ways are in. These are extremely limited so you can only order via email direct from us. 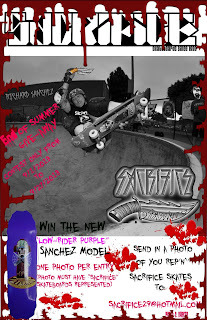 Send an email with the title "sanchez purple" for ordering instructions and payment. 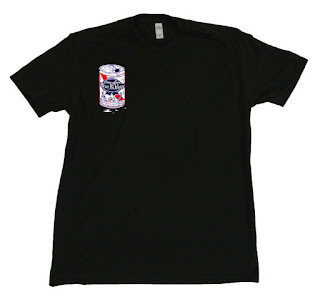 We apologize for the hassle, but we have to make sure we watch the inventory on these. 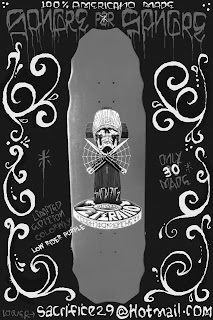 Deck pricing: $50.00 per deck plus shipping (shipping is based off city and state). 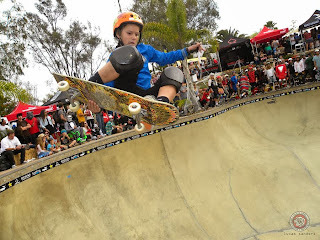 Sacrifice mini-ripper Lucas Sanders getting it done at the 2013 Skate Expo. "The Future is Now!" 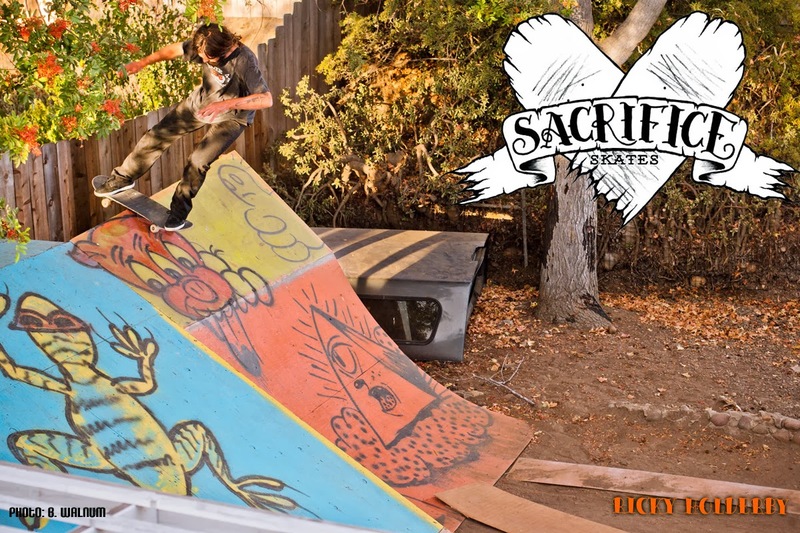 Sacrifice is stoked to announce our newest addition: Eli Reams! This Ohio native kills all terrain all the time. welcome to the familia little vato! Big thank you to Christian Hosoi and everyone who came out to support this great event! 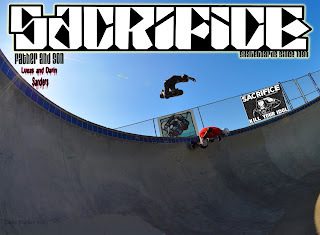 Sacrifice Team Rider, Lucas Sanders took 2nd place in sponsored AM Division. Support those who support skateboarding! 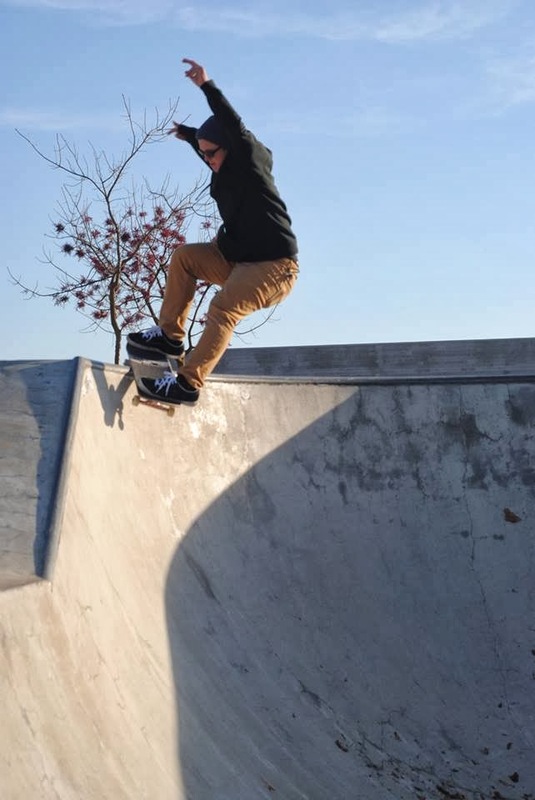 Sacrifice Skates Mini-Ripper Lucas Sanders getting it done in Nor-Cal. Enjoy! 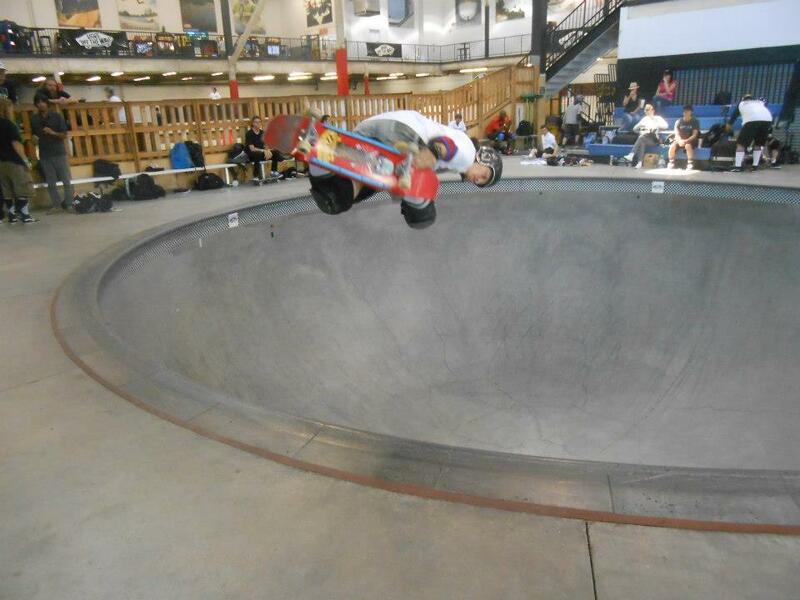 Come hang out with Skate Legend Christian Hosoi and many others at the Skate Expo this Friday, Saturday and Sunday. 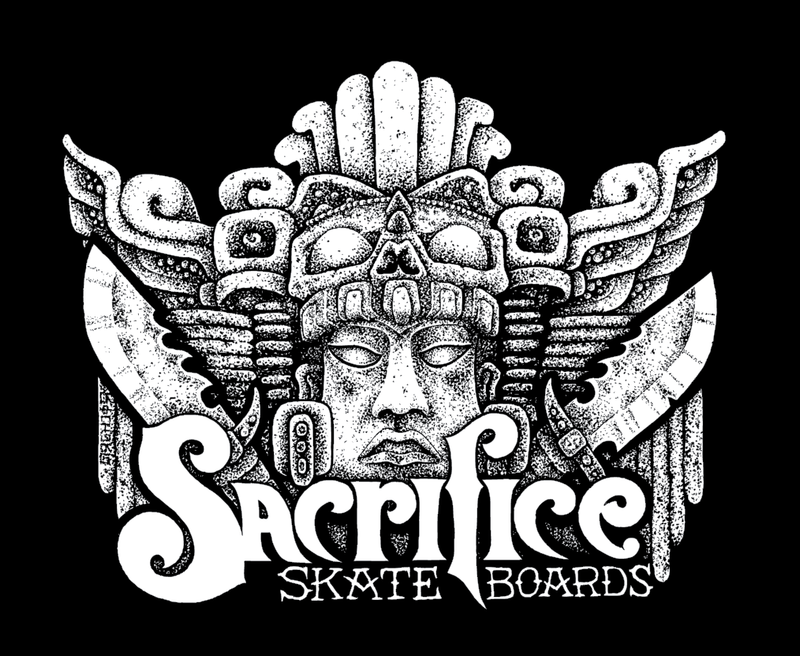 Sacrifice Skateboards will have a booth with all our gear, as well as custom leather goods from Sacrifice Veterano and Team manager: Richard Sanchez. Look for Richard in the many demos and events through out the weekend, with an autograph session on Sunday! Richard will also be doing custom air-brushing and art!! Sacrifice Veterano Richard Sanchez throws up a lofty one at the Santa Monica O.G. Jam. 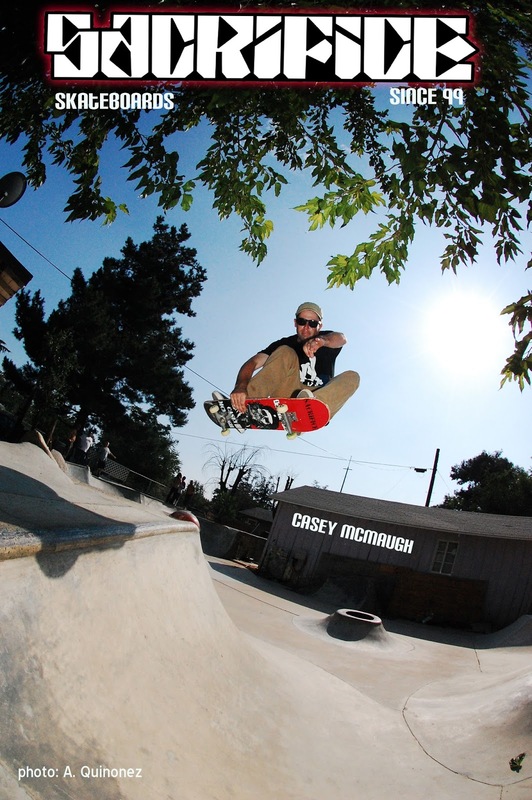 This month's "Street Life" photo is Sacrifice Veterano Casey Mcmaugh doing a proper wall ride at a local D.I.Y. spot deep in the I.E. 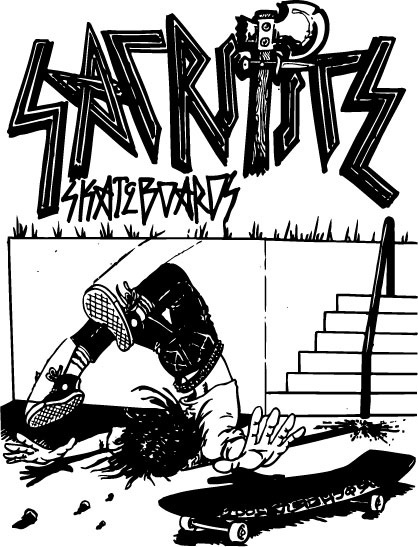 Make what you Skate! Gil has one of the craziest ollies in the business right now. HUGE gap transfer from a week back. Look for more "Street-Life" photos from Roberto Barrios coming soon! 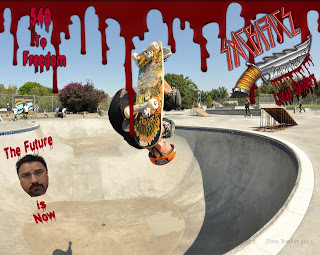 Thanks to our homeboyz at Typical Culture, The Hype Train full length video is up and FREE!! 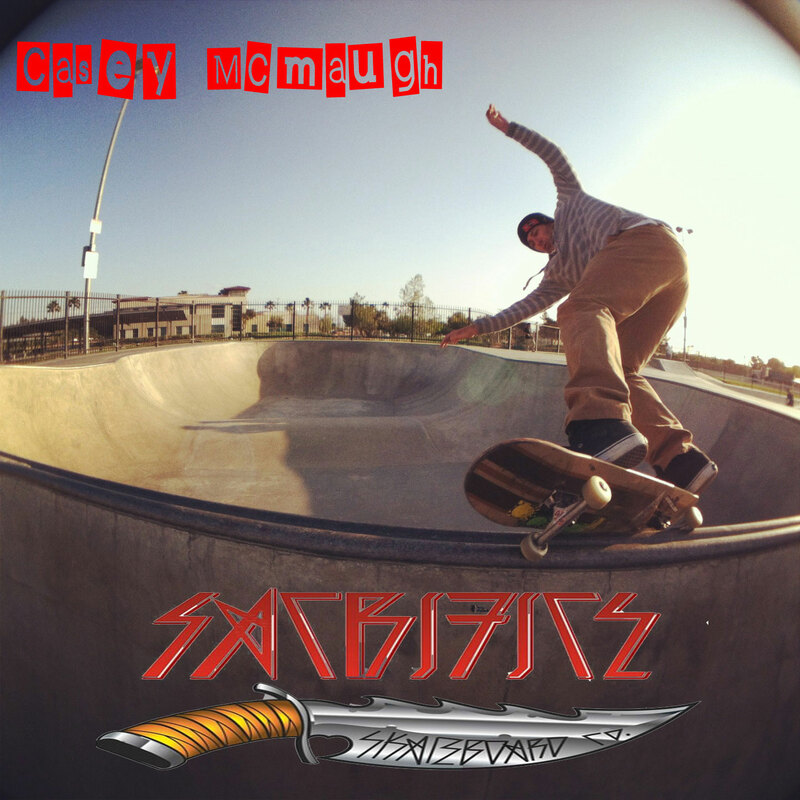 Don't forget to concentrate on Sacrifice Killer Ricky Holderby's part. Enjoy!! this months new Low Card ad features BJ Morrill taking care of business at Orcas Island. Sanchez, back side ollie no strings attached..
Look for more photos coming soon as well as our new ads in Low Card and Confussion! 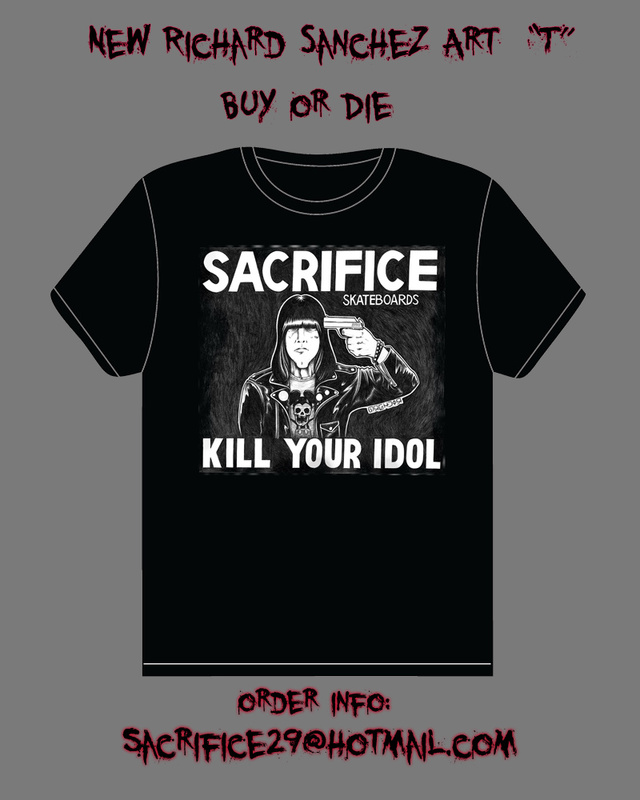 Here is another teaser of the Full Length Sacrifice Video coming sooner than later....Enjoy! Sacrifice 'Slam' Stickers are In! Remember, NO STAMP NO STICKERS! 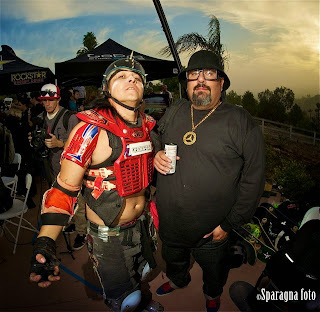 Sacrifice Team Manager, Art Director and Veterano Richard Sanchez has a killer interview with Jeremy Hight at unlikelystories.org. Read it and learn more about my homeboy! Jeff gets a rad shot at Rusty's courtesy of Mr. Eric Nash. Welcome back homes! The newest Sacrifice Skates Art Collection "T" with all origianl graphics by Richard Sanchez. These are VERY limited and only available for a short time. 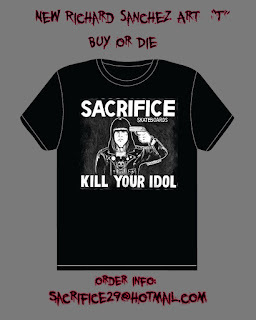 BUY OR DIE! It's been about 4 years since our last zine. Back again just because I felt like it. Free where you can find it...seek and ye shall find! On the cover: Richard Sanchez and Lucas Sanders: Double Trouble. Gil is a ripper and goes big everytime all the time. Beinvenido a La Familia! Ride with Us...or Collide with Us! 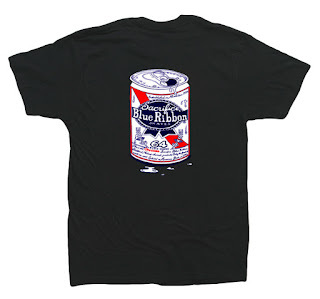 Sizes: XXL, XL,L and M.
Down and Dirty Wall rides in S.D. Dave Deluna, grabber-grinder over the box in Las Vegas! Come hang out at our booth and buy some Sacrifice gear direct! Team riders will be lurking all day, come by and support! 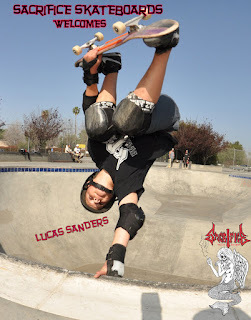 We are stoked to bring on board to La Familia, Lucas Sanders. Kid is a 100% RIPPER and all around great youngster. He took first place at this years Basic Bowl and from the photo; you can see why! Sacrifice Veterano Richard Sanchez is going up against some heavy duties to qualify for this years Vans Pro-Tec Comp. Come by tonight at 7PM at the Vans Block of Orange and show your support!